Inspired by the attempts of other people around the Interwebs, I use a motor as a rotary encoder, but with a different approach. This project was created on 08/18/2018 and last updated 7 months ago. As seen from other authors around, it is possible to use a permanent magnet motor as a rotary encoder. But the usual method has some serious disadvantages. Instead of using the motor as a generator, I use it as a set of coupled inductors. This makes it possible to determine the angle of the rotor in a stationary position. It can be done using any common microcontroller, with only a few or no extra parts. This approach also opens the possibility to use a motor as a human machine interface with haptic feedback, since the measurement can be so quick, it doesn&apos;t affect the motor driving signal. The aim of this project is to find the principles of the operation, implement it on a basic level and provide a starting point for future developments. Small 3 phase motors can be used as a set of coupled inductors. If you run current through two leads, you drive two coils in series. The third lead is also connected to the star point through the third coil. If the current is DC, the coils act as a simple voltage divider, the 3rd lead has half the driving voltage. If the current is AC, there is also some electromagnetic coupling among the coils and it includes the rotor. If the rotor is not in a central position between the coils, it bends the flux, the voltage will be uneven, and easily detectable. Even with a common microcontroller. I used a Blue Pill (based on STM32F103 MCU) with STM32duino firmware. I connected it to a set of half bridges. It is needed to drive the motor with a higher current. The motor leads are connected to the these bridge outputs, and also to 3 Arduino ADCs. The inductive coupling and thus the angle of the rotor is indirectly measured with these. I set one selected half bridge to drive the motor lead to low level (ground), another one to high (power supply), and the third one to nothing (floating). Right after the voltage is applied to the coils, current rushes through, and on the floating lead a voltage is measured. Ideally, the measurement is done in a few microseconds, and precisely timed for repeatability. The 3 phases can be measured is 6 combinations, as 3 pairs. The pairs are inverted to each other because of the opposite polarity. Practically 3 channels can be selected for operation. 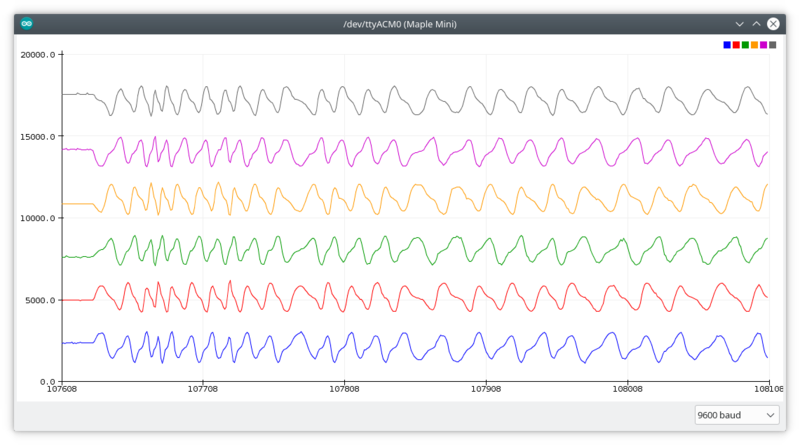 For each channel, an angle/signal plot can be drawn, and at the positions where it aligns with the motor&apos;s steps, well defined levels are present. Once the correlation is mapped, detecting and tracking the movement is relatively easy. Implementing haptic feedback is straightforward. Just drive the motor as you should anyway, interrupt it for a few milliseconds (microseconds with more optimized code) while you measure angle change, then continue. With certain driving schemes, interruption is not necessary at all. The sample code I wrote is available on Github. It is a proof of concept, not application quality, but good enough to play around with it. It writes current position (step) on change and accepts commands via serial port. Position can be overwritten (rotor follows actively) and haptic feedback can be turned off (movement tracking continues). With this project I wanted to prove that, it can be done. And I did it. To reach a secondary goal, I&apos;m making this documentation. Hopefully anybody, who is familiar with Arduino and electronics, can understand the principles and start developing a useful application with it. Better reliability, responsiveness and repeatability. Find better mapping and tracking methods. It can improve the attributes in previous line. And scanning at higher speeds may become possible. Autotuning. Connect any motor, send a command, wait a little, ready to go. Higher resolution. I selected a few convenient positions for steps, but this shows much more potential. Makes it possible to define positions not depending on motor configuration, but purely by software. E.g. uneven steps, changing steps on the fly as user wanders around a menu. Code, schematic and any other media content related to this project, which is created and published by me (besenyeim) is under Creative Commons Zero license. No Rights Reserved. I didn&apos;t post this screenshot previously (didn&apos;t seem important), but it shows the problem with high speed. I set higher frequency scanning and spun the thing by hand with a speed that&apos;s unusually fast for a knob. The graph shows how the rotor slows down after that. Note how the pattern is changing by time. Not just amplitude but the shape too. The EMF distorts the signal so much, my simple algorithm can&apos;t recognize the changes. That&apos;s why I mentioned in the project details that an advanced method is needed for this case. It almost worked. Tuning was a nightmare. Measurements were noisy, and levels were almost indistinguishable. It jumped back and forth, sometimes started to rotate indefinitely. For a few steps, it worked, but wasn&apos;t as nice or reliable as the HDD motor. Well, almost. It is working. Writes the position to serial. It can be overwritten via serial, the motor will turn to that position. Haptic feedback can be turned off. Still misses steps sometimes, but it is rare, and I think this won&apos;t be an issue if not only basic Arduino functions are used, but some advanced methods. The code could be nicer, I have to work on that. I&apos;ll upload the current, ugly version anyway. For the impatient. Some schematics would be great too. I&apos;ll do that later. So, my sophisticated method for analyzing the results was to draw lines over the screenshots in paint. And on paper with a pencil. :-) Just to understand the data well enough. The sensor data comes in 3 pairs. Mirrored to each other. Simply because I measure all sets twice, with opposite polarity. We can select 3 to work with in operation. The period of the sensed signal is half of the drive signal. The motor has 6 steps in one magnetic cycle (my motor has 4 cycles, 30 steps/revolution) and the sensed signal repeats after 3 steps. That can be a problem with haptic feedback. When you switch it on the first time, the controller doesn&apos;t know in which half of the magnetic cycle the motor is. That can cause a bigger than normal jump of the rotor, and missed or false steps. Not catastrophic, but inconvenient. It can be moderated if the high current drive is ramped up with PWM. In my opinion, the easiest way to detect a movement is to store the last step, and measure one signal of the selected 3. In every "clean" step, one of them is at center position, in my case that means an ADC result of 2000 - 2150. The high position can reach 2800, low 1300. (Due to laziness, I only noted one channel.) selecting threshold values is easy. If that channel is measured, which should be centered, and it goes up, that means a step in one direction, down is the other. I hope you see it. I surely don&apos;t.
So, after the last successful step, I took a big leap... and then failed. OK, there was an intermittent one, I determined the motor&apos;s coil sequence and made it spin. Also that, what kind of change should I look for. Then the logical step and the seemingly easiest way was to scan with short current pulses for movement, update the tracking variable, scan accordingly again. Why is this logical? Because implementing haptic feedback is just lengthening the pulse. But no, doesn&apos;t work. "Maybe if I make it longer, so it jumps into the next position." No. The problem is, if I wait too long, it skips steps. If I wait too short, it oscillates mid-steps. You can take a look at the code where I gave up this side. Some basic definitions and a single phase test. PoC. If you change the delays in the code, you can change the sampling frequency and the on-off ratio. With more on-time the rotor wants to stay in a certain position. That is basically a method for haptic feedback. A few days ago I received my first Arduino compatible boards. I&apos;m not a fan of Arduino, but that&apos;s what many people like and almost everyone have. These are cheapo "Blue Pill" STM32 based boards. The first thing I did was to flash them with STM32duino. 6 digital outputs are used, because we need to drive the high and low side transistors separately, the phase which is not driven should be floating, hi-Z mode is necessary. 3 analog inputs are used as feedback. The phase voltages are measured with them. Currently everything goes from 3.3V. The chip is powered from USB, but there is a separate power supply for the motor. The analog inputs can withstand 3.3V only. If the motor&apos;s supply is higher than that, voltage dividers are needed on the feedback lines to protect the MCU. If you want to use the encoder passively, 3.3 is enough, but for haptic feedback a higher voltage is probably needed. This is exciting for its possible use in a DIY Novint Falcon-type input device. Converting a Manual switched washing machine in to a Arduino powered smart washer. This project chronicles the successes, and frustrations to defeating the securities put in place by RV appliance manufacturers. You are about to report the project "Motor as Encoder", please tell us the reason.